This discovery did hit the world as one of the more bizarre small-scale events of World War II. The story of a mutt’s involvement in a legal brawl with a totalitarian government at such a crucial time is, indeed, as strange as it gets. By 1941, the invasion of the Soviet Union was just around the corner. Nazi Germany’s aim was to conquer Europe and beyond. By 1941, it was neck-deep in combat with the opposing Allies. However, back in Berlin, investigations were ongoing about a possible act of disrespect to Hitler by a civilian in Southern Finland over 1,000 miles away. This reported incident involved Jackie, a black and white dog in Tampere, a city in then Nazi-friendly Finland. The dog was said to have mocked the Fürher and the entire Nazi regime by making a caricature of the Nazi salute every time the name “Hitler” was mentioned. Tor Borg and his dog Jackie. The dog had been trained to react to the command “Hitler” by raising a paw. Fair Use. Jackie’s master, Tor Borg, was a Finnish businessman and the owner of a big pharmaceutical company in Tampere. 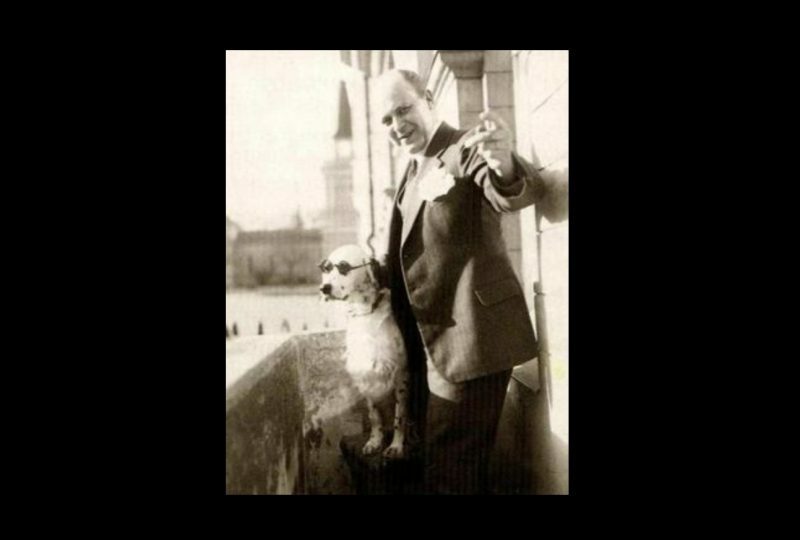 It’s clear from looking at a picture of him posing with Jackie (decked out in a pair of round shades) that Borg had a good sense of humor and was quite fond of his dog. 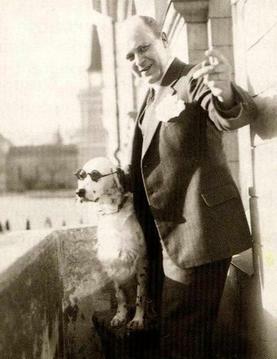 But on the 29th of January 1941, German vice-consul Willy Erkelenz in Helsinki wrote in a telegram that an anonymous witness had reported that Borg’s dog had been trained to raise its paw in a mock Nazi salute at the mention of Hitler’s name. Borg was promptly summoned to the German embassy in Helsinki. This matter quickly spread like wildfire, involving not only the German Foreign Office but also the Economy Ministry and Nazi Party Chancellery. As he faced interrogations from the officials, Borg vehemently denied any form of disrespect to Hitler. Clearly, the Finnish businessman was panic-stricken by the allegation. His pharmaceutical company relied substantially on German suppliers. Letting that single episode severely affect his business relationship with those suppliers would see his business crumble. During his session with officials from both Finland and Germany, Borg conceded that his dog did raise its paw “on a few occasions” in a way that may have had a comical semblance to the Nazi salute. He admitted that Jackie did this anytime his wife, Josefine, called it “Hitler,” a nickname she’d given the dog because of this particular trait. Josefine was a German known to harbor some anti-Nazi sentiments. Although he admitted to the dog’s occasional display, Borg insisted that neither his family nor Jackie had in any way insulted the Third Reich. This was enough for the government to let Borg go for the moment. However, after he was released, the Nazi diplomats sent a telegram to Berlin saying that Borg seemed to be lying. As a result, Tor Bogg and Jackie came under the meticulous investigation by government representatives. For three months, the Foreign Office probed Borg, working relentlessly to find grounds upon which they could bring him to trial. To try the businessman successfully, the Foreign Office needed witnesses. However, nobody came forward to testify. Ultimately, following a piece of advice from the Chancellery, the trial attempt was called off in March 1941. Although charges were not pressed, Borg was still not left in peace. In a bid to make him pay for his “crime,” the Third Reich moved towards sabotaging his business. This included an endeavor by the Economy Ministry to get the German pharmaceutical conglomerate IG Farben to stop supplying Borg’s company. It remains unclear whether Hitler himself was aware of the episode. Perhaps Borg’s fate could have been a lot more disturbing if the Führer knew about it. However, neither Jackie nor his master was harmed in any way. Jackie died of natural causes several years later. Borg passed on in 1959 at age 60, with his wife following suit in 1971. Borg’s company, Tampereen Rohdoskauppa Oy, thrived but was renamed to Tamro Group. It currently exists in over 25 countries and has over 30,000 employees. The incident about the “Hitler-mocking” dog and Nazi Germany’s reaction would fall into the dusty archives of Germany’s history, to be completely forgotten. It was lifted out of obscurity when a cache of documents concerning the incident was dug up from the German federal archive in 2011 by Klaus Hillenbrand. According to him, the story (which he called “the dog affair”) was proof that Hitler’s regime was so obsessed with finding enemies that they were paranoid about everyone, including dogs. Fair Use: Though this image is subject to copyright, its use is covered by the U.S. fair use laws because:# It illustrates an educational article about the entity that the logo represents.